Mouser Electronics, Inc. today announced the update of their Power Supply Technology site. 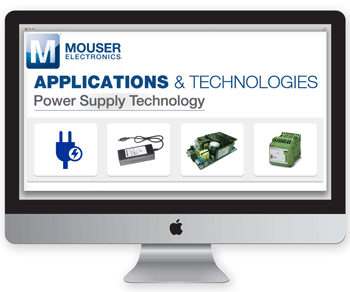 Mouser’s updated technology site provides developers with the resources they need to learn about the latest advances in power supply technology, and the newest products available from Mouser Electronics for selecting and building power supply systems. The updated Power Supply Technology site, available on Mouser.com, contains valuable resources for developers interested in expanding their knowledge about power supply systems. The new Technology Section provides an overview of power supply technology and segments power supplies into four main subsections: AC/DC supplies including linear regulated and DIN‑Rail power supplies; DC/DC switched mode power supplies and topologies; AC/AC transformers including single‑ and three‑phase conversions; and DC/AC converters including uninterruptable power supplies (UPS) and solar inverters. These subsections describe the use and operation of each type of power supply. Functional block diagrams are provided with explanations of each block, along with a list of power supply products available for same-day shipping from Mouser.com. The Articles section discusses new topics such as AMP Consortium Steers Future of Digital Power, The Benefits of Power Modules vs. Discrete Regulators, and Advancing power supply solutions through the promise of GaN. All articles offer an area to post comments and questions to facilitate further discussions on the topic. The Featured Products section focuses on key power supply products available from Mouser.com that are ready to be used in developer’s systems. Products include the CUI Novum® Intermediate Bus DC‑DC Converter, the Phoenix Contact UNO POWER DIN Rail Power Supply, and the Murata Power Solutions OKDx DC/DC Power Converters. Additional components for power supply systems are listed including multilayer varistors, power inductors, tantalum capacitors, and 200 Watt diodes. Finally, the Resources section lists videos, application notes, and reference designs that discuss product selection and system considerations when building or buying power supplies. Topics include battery chargers, circuit protection, energy efficiency, and the importance of product certifications. To learn more, visit: http://www.mouser.com/applications/power-supply-technology/ . With its broad product line and unsurpassed customer service, Mouser caters to design engineers and buyers by delivering What’s Next in advanced technologies. Mouser offers customers 20 global support locations and the latest, most technologically advanced components for their newest design projects. Mouser Electronics’ website is updated daily and searches more than 10 million products to locate over 4 million orderable part numbers available for easy online purchase. Mouser.com also houses an industry-first interactive catalog, data sheets, supplier-specific reference designs, application notes, technical design information, and engineering tools.